Yeoman refers chiefly to a free man owning his own farm, especially from the Elizabethan era to the 17th century. Work requiring a great deal of effort or labor, such as would be done by a yeoman farmer, came to be described as yeoman’s work. Thus yeoman became associated with hard toil. An odd way to start a newsletter! But you will understand why when I begin to describe the yeoman’s work performed by our volunteers at the museum. Michele Krakowski has been on a cleaning mission. Peter Giammarco and June organized and worked during the Colonial Weekend at the museum Oct. 6 & 7th, Don Goncalves publicized our events to bring in record guests, Lonnie Thurber has been chopping down dead trees, Miss Julia Mendonca has been teaching doll making with guests of all ages, Bob Sherman organized and filed our 2011 taxes and Bob Guertin has managed to keep all the grass mowed! Many thanks to all of our other volunteers as well. To old business: On September 13th we held our annual Membership Meeting, and elected several new officers, so please welcome to their new posts, President Deb Cote, Membership Chairperson Michele Krakowski and Treasurer Bob Sherman. 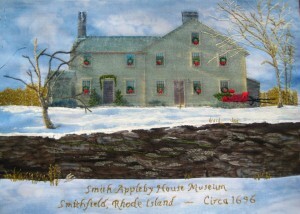 On December 2, we hosted our Christmas at Smith-Appleby event. Attendance was lighter than last year, but that made for less congestion in the house. We saw many of our regular visitors, and seeing the same children from years past continuing a family tradition of visiting Santa at the museum made the event more than worthwhile. Thanks to all the volunteers who assisted with baking, and who assisted during the day. Our membership Christmas party will be held on December 15th, at 6:30 this year. This is a pot luck dinner, with a Yankee Swap to follow. Leave a message at the museum letting us know if you will attend, and what dish you would like to bring. Very best holiday wishes to our far-away members who can not attend. Our new fiscal year began on September 1, so membership dues for the 2013 year are due now, unless you have recently renewed your membership.